A public meeting was called for May 23rd 1989 when the Friends of the Helmeted Honeyeater (the Friends) was born. It was due to the determination of the late Steve Craig that the public answered his call to do something about the plight of the Helmeted Honeyeater. Prior to Steve Craig rallying the public to become involved in conservation of the state bird, Bird Observation & Conservation Australia formerly Bird Observer’s Club of Australia (BOCA) had worked for many years to save the Helmeted Honeyeater. BOCA alongside the Victorian Ornithological Research Group (VORG) and the Royal Australasian Ornithologists Union (RAOU) were responsible for influencing the State Government to set aside land for conservation which ultimately became the the Yellingbo Nature Conservation Reserve (YNCR). In 1952 Survey Cassidixwas organised by BOC (as it was known then) and RAOU. It lasted for ten years and was followed by further VORG surveys. The data from this long term surveying provided the evidence to persuade the Government to take action and in 1967 the first declaration of land set aside for the reserve was announced. BOCA was also at the head of the push to have the Helmeted Honeyeater recognised as the State Avifaunal Emblem. The Friends of the Helmeted Honeyeater recognise the work of Steve Craig, BOCA, VORG and RAOU. From that time on there have always been two distinct aims, one that would improve the status of theHelmeted Honeyeater in the wild and another that would increase public awareness of the status of the Helmeted Honeyeater. The Friends tackled the first aim by looking after what remained of the natural habitat in the Yellingbo area and wherever possible developing revegetation projects to improve or create new habitat. At first the Friends were not needed as volunteers in the Yellingbo Nature Conservation Reserve (YNCR), so the focus of the revegetation group became working with landholders whose land was close to YNCR, planting indigenous tube stock on fenced areas of their properties. A total of 16 landholders allowed the Friends to revegetate part of their properties in the first 6 years of the Friends operation. Almost 15,000 indigenous plants were required for this project. In the years that followed, it became apparent that the works needed to be switched to the reserve. From then until now the group annually conducts a number of revegetation and restoration projects. Over the years numbers of tube stock planted have varied from 5,000 to 24,000 depending upon rainfall. Volunteers who provided the labour were school children from primary through to tertiary age, Girl Guides, Boy Scouts, community groups and corporate groups. It the early years it became obvious that the Friends needed an indigenous plant nursery to provide plant stock. From humble beginnings the nursery at Yellingbo has grown to a medium sized operation that now supplies plants for the Friends, Parks Victoria, Melbourne Water, Yarra Ranges Shire, Port Phillip and Westernport CMA and local landholders. From a few thousand plants in 1992 there has been a gradual increase to the annual total of over 90,000 plants today. Seed stock is harvested from the Yellingbo area by volunteers and a volunteer curator cleans, labels and stores over 225 species. At the beginning volunteer managers supervised all volunteer workers. It has been necessary to employ a manager and an assistant, who now works 2 to 3 days per week. Volunteer labour ensures that the nursery venture is a profitable one with all profits going directly back into the work that the Friends do. The plant stock is regarded highly by all of the Friends customers. The work associated with the nursery has meant that the Friends have developed an understanding of YNCR which is invaluable for habitat restoration. This knowledge has been readily available for use by the Helmeted Honeyeater Recovery Team. The second aim involves community education. In 1992 funding was obtained to employ a community education coordinator for 1 day a week for 3 years. This was so successful that the Friends have funded this position since 1995 with the plant nursery providing the source of funds. The community education co-ordinator is now employed 4 days per week. An important function of the co-ordinator is to obtain funding for revegetation projects within YNCR. Working with primary and secondary school students to learn about the flora and fauna of YNCR enables the coordinator to engage them in practical programs in the reserve. A particular focus has been Yellingbo Primary School which is at the northern end of YNCR and Macclesfield Primary School which is at the southern end of YNCR. These “book end schools” have been engaged in an Ambassador program since 2006. 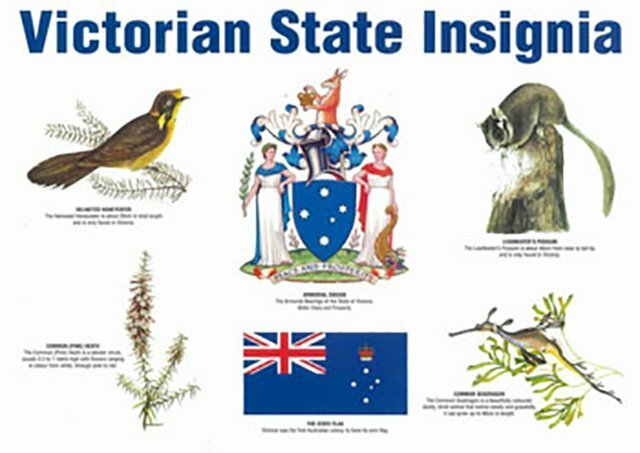 Students are chosen annually to participate in an intensive study of the Helmeted Honeyeater and of Leadbeater’s Possum. As Ambassadors they are charged with working with their contemporaries to educate them about conservation issues for the State Emblems. Since the closure of Yellingbo Primary School in early 2016, the Friends have begun a successful Ambassador program with Berwick Lodge Primary School which is located in the Birds former range. We hope in the future to extend this program to other schools in the local area and within the former range of the Bird. The Friends have made the publication and display of educational material a high priority. In 1992 Premier Joan Kirner launched the Friends education kit, which was made available to all schools in the Eastern Region. The first picture story book was launched, “Hilton the Helmeted Honeyeater”. In 1993, “A Bird In Time” an historical display of the Helmeted Honeyeater was held in the State Bank Galleria and opened by the Hon Mark Birrell. A sound cassette tape was made featuring soundscapes of YNCR in 1997. “The Plants of the Yellingbo Reserve” was launched in 1999. Governor John Landy launched the picture book sequel “Hilton Hunts for a Home” in 2004. The three local MP’s Tammy Lobato, James Merlino and Heather McTaggart launched “Yellingbo a Special Place” in 2006. This book tells the story of what is happening in YNCR and what Helmeted Honeyeaters are doing on a monthly basis. In 2009 the Friends launched “the First 20 Years” which is a detailed description of Friends activities. In 2013, after an approach from a member of the Friends, the group published “Lunar the Leadbeater’s Possum” by Mieke Florrison. At the time Mieke was an 11 year old student at Macclesfield Primary School. The book is currently in a third edition. In 2017 to celebrate 50 years of the reserve and 150 years since John Gould named the Bird the Friends published “A Reserve for A Bird” a history of all the groups and individuals whose determination and foresight saw the establishment of what is now known as Yellingbo Nature Conservation Reserve. In addition to working to support their aims, the Friends have assisted the Field Ornithologist, Bruce Quin, wherever possible. Bird surveys, supplementary feeding and record keeping have been the main tasks. In partnership with Bruce Quin the Friends are able to share their knowledge of the reserve. The selection of plant species for revegetation, areas for infill planting and regular reporting of the health of the habitat have been greatly appreciated. The release program of captive bred birds from Healesville Sanctuary has meant that supplementary feeding would require a regular group of volunteers. At present there are 100+ volunteers assisting with feeding and observing release birds 5 days a week. Since 2015 DELWP (Department of Environment, Land, Water and Planning) have provided funding for the Friends to employ a Volunteer Feeding Coordinator. The captive breeding program at Healesville Sanctuary receives positive attention from the Friends. Since 1989 when David Middleton set up the program and later when Ian Smales continued with the project, the Friends have always provided support when required. Close liaison is maintained with Karina Cartwright and the breeding program has become a vital part of the community education program, both for the school Ambassadors and the Friends membership. 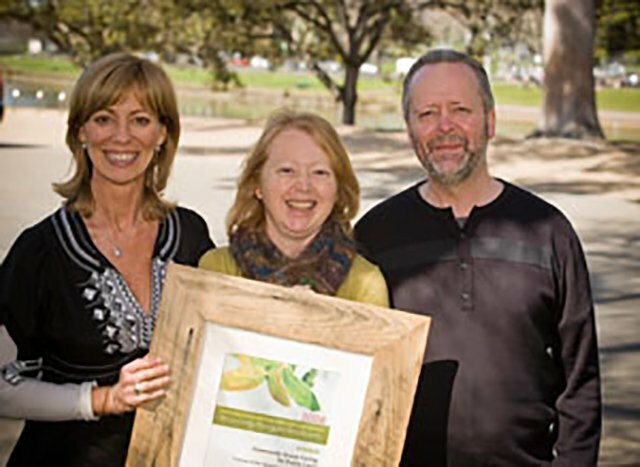 Over the past 25 years Healesville Sanctuary has provided the Friends with much support and encouragement. A feature of the Friends efforts over the last 25 years has been the ability of the group to be an advocate for the Helmeted Honeyeater and its special environment. Governors of Victoria have accepted the role of Chief Patron and they have either visited YNCR or received visits from the Friends. Members of State Parliament have visited YNCR as have Yarra Ranges Councillors at the invitation of the Friends. Successes of the group are in evidence when one sees that revegetation projects are maturing and providing new and improved habitat for the Helmeted Honeyeater. 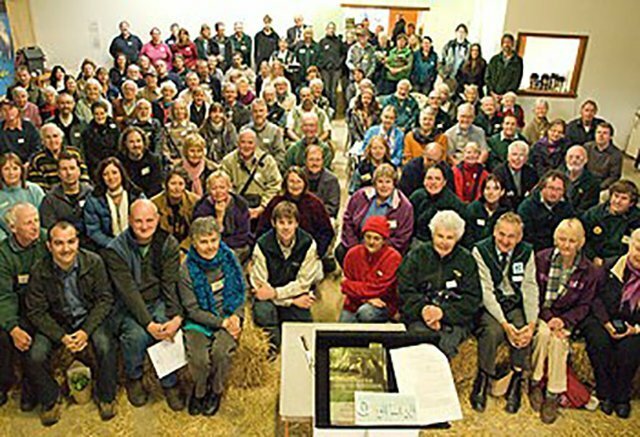 In 2006 the Friends joined with Macclesfield Landcare to produce a Local Area Plan (LAP) document which was launched by former Premier Joan Kirner. The LAP became the forerunner of a number of initiatives that have provided the stimulus for present day programs that work towards ensuring the habitat for Helmeted Honeyeater and other key fauna is maintained and improved. The Yarra for Life (Y4L) program organised by Port Phillip and Westernport CMA works with local landholders to improve and increase indigenous vegetation on their properties; and the State Government Yellingbo Conservation Area (YCA) plan to manage public land between reserves in the Yarra Valley are the future hope for conservation of the Helmeted Honeyeater. The Friends, Macclesfield Landcare, Johns Hill Landcare and Monbulk Landcare have developed a plan recently to work with landholders and Parks Victoria to provide habitat along the Woori Yallock Creek from YNCR to Butterfield Reserve in the Dandenong Ranges. 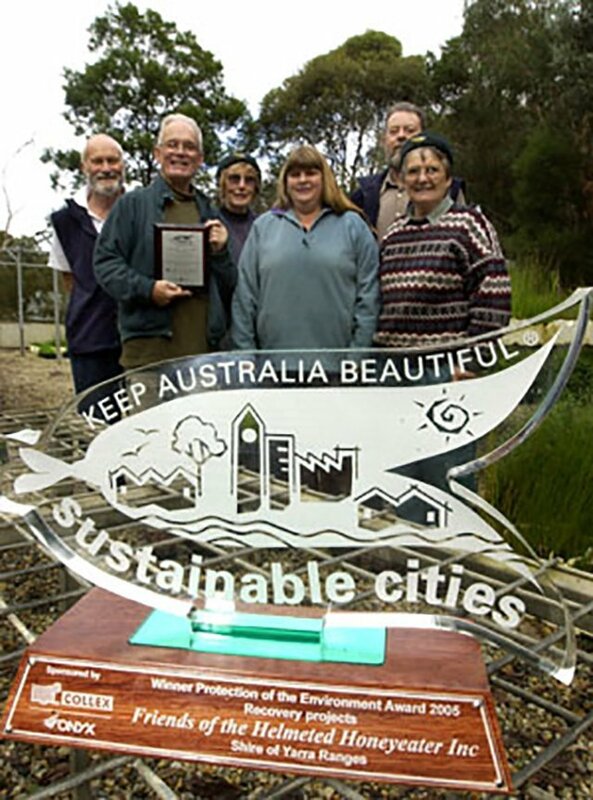 In 2005 the Friends were nominated for the Keep Australia Beautiful Victoria Awards and received the Protection of the Environment Award.